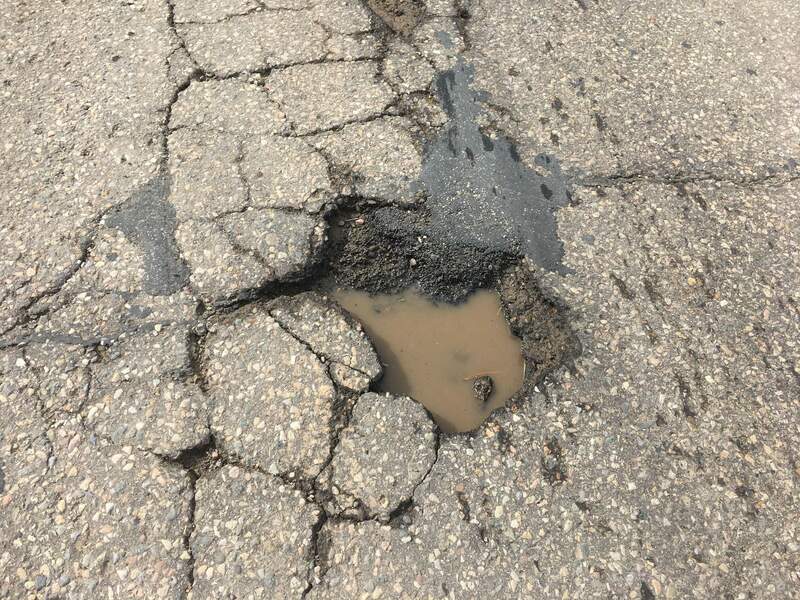 A snowy winter has contributed to numerous potholes appearing in roads throughout Durango, including this one on 32nd Street. “Street Sweeper” asks whether GoFundMe pages could be set up to raise money to fix them. Although Action Line writes public accountings of questions that are certifiable, he is no certified public accountant. Nonetheless, if you want to pave the way for a pothole GoFundMe campaign, note that most donations are not tax deductible. In other words, you better have a CPA to CYA. Thus, a Durango Potholes GoFundMe group could claim (wink, wink) the campaign will shield local kids from the pain and suffering of eventually having to deal with city’s street non-stewardship. Or, donations would (cough, cough) prevent injuries to dogs riding in cars. Area dogs are at grave risk of being thrown around when drivers hit the craters or suddenly swerve to avoid potholes. So who’s going to set up a tax-favored GoFundMe site? Perhaps it could be one of the many local nonprofits. After all, there is one nonprofit for every 167 La Plata County residents. Yup. That’s a real number. It also explains the overabundance of cheese cubes, boxed wine in plastic cups, silent auctions, raffles and bake sales. Perhaps someone could organize Friends of Potholes. Or Pothole Smart. Or the Pothole Resource Center. “It would be a tough sell,” said our good friend Christina Rinderle, former Durango mayor and chairwoman of Citizens for A#1 Durango, the group advocating for the half-cent increase in local sales tax to repair infrastructure. “I can’t imagine what a ‘Friends of Potholes’ logo on T-shirts would even look like,” she added with a laugh, demonstrating that you can use humor and still be serious. Rather than a GoFundMe site, Christina asks citizens to check out a1durango.com for more info and to please vote Yes. Regardless of tax issues, why not create a Durango Potholes GoFundMe site as a Plan B? In a nutshell, it’s been tried and it flat out fails. A search for “potholes” in GoFundMe.com brought up around 500 results, with several people or pranksters (it’s hard to tell which) asking for donations to fix local public roads. With almost unanimity, there were zero donations for municipal potholes nationwide. We’re talking Detroit, Indianapolis, Brooklyn, Compton, Des Moines, Omaha, Lexington ... the list goes on. Durango thinks it’s special and all that, but there’s no reason to believe Our Fair City would be any different than other pitifully pitted places. But there’s one notable exception. A GoFundMe in Milwaukee asked funders for cash so volunteers can fill potholes with soil and plant flowers in them. As of a couple days ago, it raised 60 bucks toward its goal of five grand. E-mail questions to actionline@durangoherald.com or mail them to Action Line, The Durango Herald, 1275 Main Ave., Durango, CO 80301. You can request anonymity if you organize Durango Potheads for Durango Potholes and see if anyone would join.